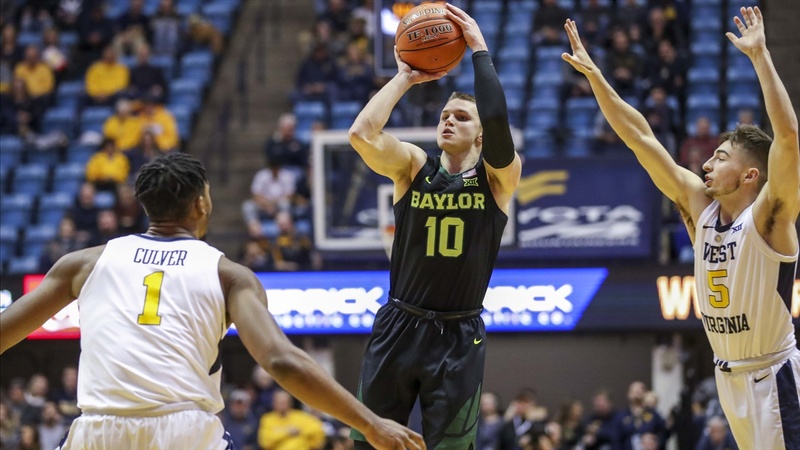 IRVING, Texas – Baylor senior guard Makai Mason was named the Big 12 Conference Men’s Basketball co-Newcomer of the Week, as voted on by a panel of media members and announced Monday by the conference office. Mason is the first Baylor player to earn Big 12 Newcomer of the Week since Manu Lecomte was selected nearly two years ago on Feb. 13, 2017. Mason’s honor gives the Bears consecutive Big 12 weekly award winners following King McClure’s Big 12 co-Player of the Week honor on Jan. 21. Three BU players have earned weekly awards this season, with Tristan Clark named Big 12 Player of the Week on Dec. 30. The first grad transfer in program history, Mason led the Bears to a 2-0 week with wins at West Virginia and against Alabama. He averaged 21.0 points, 4.0 assists and 3.5 rebounds in 34.5 minutes per game during the week, and he shot 86% (12-of-14) on 2-point field goals. Mason led the Bears to an 85-73 win at West Virginia on Jan. 21. He posted a season-high 29 points, matching the most scored by a Baylor player this season, and added four rebounds, four assists and one steal in a game-high 38 minutes. Mason went 8-of-8 on 2-point field goal attempts against the Mountaineers. The Greenfield, Mass., native also led the Bears to a 73-68 win over Alabama on Jan. 26 in the 2019 SEC/Big 12 Challenge. He had 13 points, four assists, three rebounds and one steal, extending his career-best streak to 11 consecutive games scoring in double-figures. He’s averaging 16.5 points per game during the 11-game double-digit scoring streak. Baylor’s win over Alabama improved its record to 5-1 in the Big 12/SEC Challenge history, giving the Bears the best record of any team in either conference during the challenge’s six-year history. Baylor players have earned multiple Big 12 Player of the Week honors in eight consecutive seasons, and a BU player has been named Big 12 Newcomer of the Week at least once in 13 of the last 15 seasons. BU has earned 24 Big 12 Newcomer of the Week honors in the last 12 seasons after earning 10 such honors in the league’s first 11 seasons. All told, 22 different Baylor players have earned 34 Big 12 Newcomer of the Week awards in the league’s 23-year history. Baylor returns to action when it travels to Oklahoma tonight for a third consecutive Monday game. Tipoff is schedule for 8 p.m. CT on ESPNU. BU then returns home to host TCU at 7 p.m. CT Saturday. The Bears play three Saturday home games in February, with TCU on Feb. 2, Kansas State on Feb. 9 and West Virginia on Feb. 23. Fans can purchase a 3-game ticket package covering all three Saturday games in February for just $45. Ticket information is available atwww.BaylorBears.com/1TGF. 1997 – Leon Morris (12/30), Fr. 2000 – Terry Black (11/30), Jr.
2001 – Chad Elsey (12/18), Jr.
2002 – Lawrence Roberts (11/26), Fr. 2002 – John Lucas III (12/10), Fr. 2002 – John Lucas III (1/7), Fr. 2005 – Aaron Bruce (12/27), Fr. 2005 – Tim Bush (1/3), Jr.
2006 – Curtis Jerrells (2/13), Fr. 2007 – Tweety Carter (12/18), Fr. 2008 – LaceDarius Dunn (11/26), Fr. 2008 – LaceDarius Dunn (3/10), Fr. 2009 – Quincy Acy (11/24), Fr. 2010 – Ekpe Udoh (11/30), Jr.
2010 – Ekpe Udoh (1/4), Jr.
2010 – Ekpe Udoh (2/15), Jr.
2011 – Perry Jones III (11/22), Fr. 2011 – Perry Jones III (1/17), Fr. 2011 – Perry Jones III (2/28), Fr. 2012 – Brady Heslip (12/26), So. 2012 – Pierre Jackson (1/16), Jr.
2012 – Pierre Jackson (2/4), Jr.
2012 – Pierre Jackson (3/4), Jr.
2013 – Isaiah Austin (11/12), Fr. 2013 – Isaiah Austin (12/17), Fr. 2014 – Kenny Chery (12/9), Jr.
2014 – Kenny Chery (2/17), Jr.
2015 – Lester Medford (12/8), Jr.
2015 – Johnathan Motley (12/29), RFr. 2017 – Manu Lecomte (11/14), Jr.
2017 – Jo Lual-Acuil Jr. (12/19), Jr.
2017 – Manu Lecomte (1/3), Jr.
2017 – Manu Lecomte (2/13), Jr.
2019 – Makai Mason (1/28), Sr.